The pre-existing Rhode Island EOC CRANSTON,RI-In 2005, the government of Rhode Island appropriated newly acquired Department of Homeland Security funds to renovate the State Emergency Operations Center in Cranston, RI, to make it one of the most advanced facilities in the state and to create a centralized State Emergency Operations Center (EOC) for all of its agencies to utilize. In addition to housing the Rhode Island state emergency operations command, the newly renovated EOC is home to the state police, Red Cross, DOT, National Guard, and other critical state agencies. The EOC also supports WEBEOC emergency management software, providing all agencies with an added level of communication and messaging functionality. After researching a number of different companies that might be capable of leading this renovation, the state finally settled on a proposal from Flagship Security Systems in Massachusetts, who brought a comprehensive understanding of security-centric facilities and a proven track record of a successful design and build process. 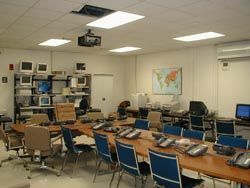 According to George Aguiar, VP operations, Flagship Security Systems, "After meeting with our team, the Emergency Management Agency decided to carry out our design for the facility that called for subdividing it into four separate rooms: a Secure Emergency Operations Center (SEOC); an Emergency Support Function (ESF) breakout area; an Executive Briefing Room; and a Communications/Messaging Room to monitor communications from the federal, state, and local agencies to maintain the highest level of situational awareness." The SEOC is the heart of the new facility, housing the essential equipment that affords department heads fully functional command and communication during an emergency. The SEOC houses 18 48-inch LCD Monitoring Desks from Middle Atlantic Products for all of the department heads (state police, DOT, Red Cross, etc. ); two additional 64-inch LCD Monitoring Desks, both of which are situated on a on a raised floor; and 13 monitors. Every position in this room in this room is also equipped to have internet access and run WEBEOC emergency management software. The two Middle Atlantic Products 64-inch LCD Monitoring Desks support six 17-inch Bosch multi-input monitors-three at each desk-that mirror a majority of all of the monitors in each of the facility's four rooms. These monitors emulate selected monitors within the facility and give the operator the ability to dictate who sees what, depending on the nature and scope of the operation. This monitoring system can be operated via an intuitive PC interface that initiates mechanical switches so that, during an actual emergency situation, all EOC personnel can access and control the video input, regardless of each person's level of technical expertise. The other rooms are equally important to the facility makeup, providing the center's huge support staff with the right technology and tools to carry out their duties. If the SEOC is the heart of the operation, then the Communications/Messaging Room is its mouth, enabling all of the agencies and employees in the EOC to communicate and organize efficiently and effectively both internally and externally. To provide adequate space for each department's communication team, Flagship installed a five position, 16 channel Telex/Vega Digital Dispatch Radio Console that is capable of talking to every state entity via two-way radio, digital or analog; five Nexus dispatch workstations with touchscreen monitors and desk microphones; 12 EFJ 5300 mobile radios with Vega interface; and five Middle Atlantic Products 48-inch LCD Monitoring Desks with two 90 degree connectors and two side units for additional rackmount space. was a 50s-style facility with extremely limited technological capabilities. The renovated center (right) is one of the most advanced facilities in the state, and has provided a centralized space for all its agencies to utilize. The Executive Briefing Room is designed to house a large number of staff for various meetings or sessions. Flagship custom built a massive conference table with fully integrated, pop-up power, telephone and data ports, two 65-inch Panasonic plasma monitors, and a Middle Atlantic Products 48-inch LCD Monitoring Desk with a fully integrated lectern. In addition to briefing in a presentation or conference style setup, members of the EOC also now use the Executive Briefing Room to organize and manage statewide Amber Alerts. Lastly, the ESF is home to an additional 25 Middle Atlantic Products LCD Monitoring Desk workstations and two 65-inch Panasonic plasma monitors. According to Paul Crawford, state emergency operations manager for Rhode Island, the first room to be upgraded was the SEOC. "We had a good idea what we wanted to install. Flagship was extremely professional and helpful in that they suggested modifications that incorporated solutions from the top manufacturers in the final design. When we saw the functional layout of the products like the Middle Atlantic Products LCD Monitoring Desks, it was easy to see why Flagship made its recommendations. Our people have been very impressed with their quality." In addition to the LCD Monitoring Desks, Flagship decided on a number of different enclosures from Middle Atlantic Products to meet various facility needs. In the SEOC, a Middle Atlantic Products 19-inch SR Series wall-mounted rack houses the components of a local CCTV system, the statewide DOT camera system that is relayed via IP from the DOT headquarters, a reserve 911 system, satellite weather and communications transceivers, router and firewall components, and a CATV controller. There is another Middle Atlantic Products rack, a DWR Series wall mounted-rack, which contains the FEMA communication remotes, the Emergency Broadcast System components, and seven Telex IP223 digital to analog transceivers. Aguiar noted that Middle Atlantic Products solutions are a centerpiece of the company's designs because they are high quality products that are easy to install and that provide excellent thermal and cable management features. "We really like the Middle Atlantic Products desks and racks," he said. "They make a good product for these types of applications, especially the swing racks which allow easy access, yet provide the durability and management features you need. Beyond that, the ergonomics are good and they are very cost effective."